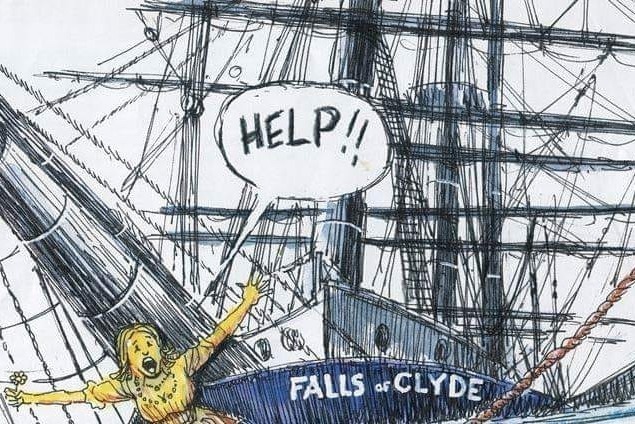 The Falls of Clyde was built in 1878 (in Port Glasgow) and was one of eight sister ships named after the waterfalls of Scotland. She is now the sole survivor and is currently afloat in Honolulu, Hawaii. However, she is more than just a piece of Scottish shipbuilding history and heritage, she is a testament to the power of Scottish shipbuilding as, after over 140 years, she is still steady and still floating. Harbours had put her up for auction but, ultimately, no one bid on her and they are now trying to dispose of her by deliberately scuttling her. We need your help to raise enough money to save her and stop her being sunk. We want to help the most underprivileged kids from our communities and take them on the trip of a lifetime. For 9 months of the year, we will be teaching them onboard with our 'education at sea' program (via fully qualified teaching staff and crew) and help them grow, mature and give them hope for a brighter future as they experience new cultures and see the world. We plan to carry Fairtrade cargo such as rum, whiskey, chocolate and coffee (to name but a few) and help communities all over the world, ensuring farmers and workers are paid a living wage and that their children are able to go to school. We also want to teach the kids onboard about these communities, getting them involved with all the steps and processes and helping them strengthen relationships and make lifelong friends. Plastic in our oceans is a huge problem and we plan to put the Falls to good use by fitting with the latest technology available and cleaning up the ocean as she sails. We will clean-up, recycle and collect the plastics from our oceans and have several promising plans in place to make this happen. We plan to fit her with the latest 'green' technology (including renewable energy such as solar, electric, hydrogen engines and - of course - wind power) to ensure that she remains carbon free/neutral and she will make a huge impact in reducing carbon emissions at sea. Becoming a role model for the rest of the world and trailblazing the latest green technology - the world will be following in her wake! We want everyone to get a chance to sail on this beautiful ship and, during certain times of the year, we will have space on board for sailing adventures. Letting the public experience life on the big blue ocean and helping them reach their full potential, reaching heights they never thought possible. All of the duties listed above will ensure that the ship will be self-sustaining whilst making a massive impact and putting Scotland firmly on the map in terms of technology, social and community causes and ensuring that we give the future generations hope for the future. You won't be just saving her, you will be giving future generations a chance to discover themselves and give them a chance to make an impact and change the world. We're sorry we haven't had a chance to update on the current situation but we have been extremely busy working behind the scenes. Originally we were working against the clock as the Hawaiian harbors department had put her up for auction and the auction ended on the 28th of February. If we could raise enough money in time, we had planned to bid on her and secure her, however, as the 28th passed, no one bid on her so we now have some breathing room and are still optimistic that we can work with harbors to bring her home to Scotland. We want to thank every single person who has donated to the campaign so far and we are continuing to raise money to ensure she can return home and be rebuilt but we still need your help to do so. Please continue donating as every single penny will be used to ensure her return journey and to, ultimately, get her sailing again.